After the huge success of our first Christmas Craft Fayre last year, it is back this year with many more amazing stalls, live music, festive refreshments, children’s activities and lots more. 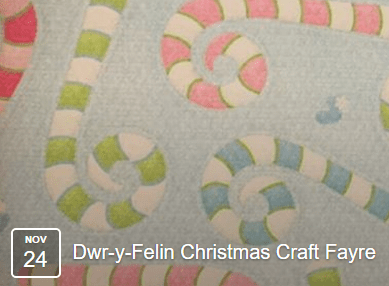 40 high quality stalls with lots of lovely ideas for Christmas. Thursday 24th November, 5-7.30 pm. We hope to see you there! Here is a full line up of the fantastic stalls available for you at the Craft Fayre next week. Please pop in for a lovely night of festive shopping and refreshments. We have Pink Elephant Crafts, Sweet Williams, Millie’s Market, Liquorice Felts, Coco Bean Chocolates, Megan Tucker Illustration, Lagoon Jewellery, Olovsdotter, Blue Canary Crafts, Jumping Clay Neath, T for two, Mali Rose Designs, Babysential, The Curious World of Miss Lupin, Truly Vintage, Shabby of Morriston, Little Black Hen, Creative Christmas, Jam Chutney, Big Stitch Little Stitch, Beach Trees, Cwtch Gallery, Once In A While, Lynne’s Card Crafts, The Crafty Woodworm, Crafty Cwtches, Blissful Aroma, Nicky’s Sweets, Nat’s Sew Crafty, Trudi & Rohan, Louise O’Hanlon, Sarah’s Crafts, The Little Homebirds, Maid Mary, A Little Bit Vintage, Young Folk Clothing, Nia A Hendry Designs, Cariad Gwrach Jewellery, Our Stall, St John’s Ambulance.